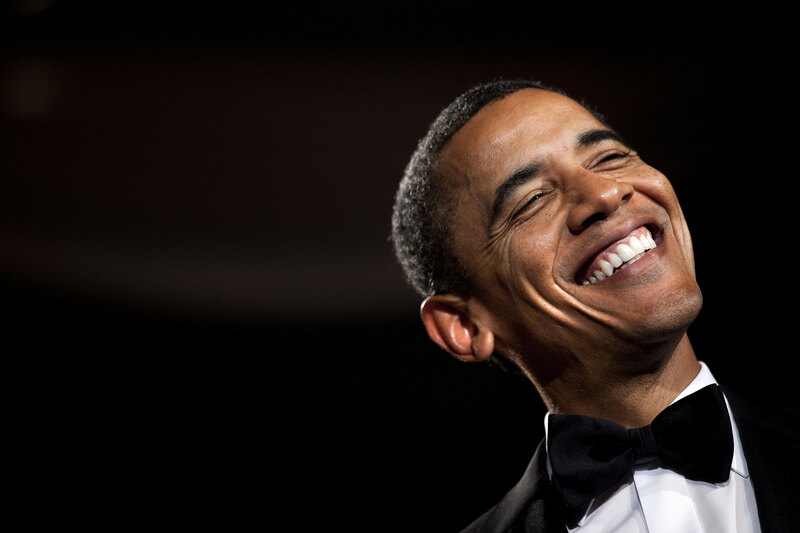 In case you needed any more proof that President Obama is one cool cat — or, at least that's he's amazing at enamoring himself to us Youths — here's one more reason for your list: According to recent reports, President Obama's scheduled to appear on Jimmy Kimmel Live! on Thursday, along with guest Sean Penn. Obama, of course, has been making the talk-show circuit rounds for years, and has a lot of amazing appearances to show for it: For instance, that time he took over Stephen Colbert's desk to see Colbert off at the end of The Colbert Report ? Priceless. Jimmy Kimmel's love of The Bachelor knows absolutely no bounds. How 'bout Barack as the lucky guy choosing his VP? Cameo from Joe Biden as loving Candidate-ette would be a glorious bonus. Look, President Obama looks totally slick in a suit. He's tall, he's svelte, he's handsome, he's got that smile. But when it comes to casual wear, he's a little bit lacking, favoring dad jeans and half-zips and very cushioned sneakers. He did admit to being a little frumpy, and maybe now that he'll have to transition back into a world where he won't eat, breathe and sleep in suits, Kimmel can help him find a new pair of denim that will ease him back into Casual Friday. We've heard the likes of Gilbert Gottfried, Ellen DeGeneres, George Takei and Tywin Lannister lend their dulcet tones to reading aloud cringe-worthy passages from E.L. James' Fifty Shades of Grey, and it's time for Barack to join the masses. Apparently the president has Kanye's personal number. Let's get him on that iPhone screen and see what they're chatting about. Probably parenting tips (coming from both sides). Barry O. does the Kanye West Very Loose Interpretation Of The Robot to the Presidential Theme. Or to Beyonce's "7/11," because WE KNOW HE CARES. This is a great fixture of Kimmel: inviting celebrities on to read some of the Twitter trolls' opinions about them. Apparently, there is someone out there that thinks Drake looks like Voldemort with hair — a very strangely crafted insult. This could get tricky with Obama, since... well, he's the president, so maybe he could read some NICE tweets about him. I don't much care for Jimmy Kimmel and would love to see Barack Obama smoke him in a dunk contest. Although, it would really be Michelle that would win this contest single-handedly against the two of them. Was the leader of the free world also consumed and haunted by #TheDress? What did he see? Black and blue? White and gold? Red white and blue? All the colors of the wind? Give us answers! Whatever happens on Kimmel on Thursday, we know Obama is gonna bring that charm. And also, Sean Penn will be there.